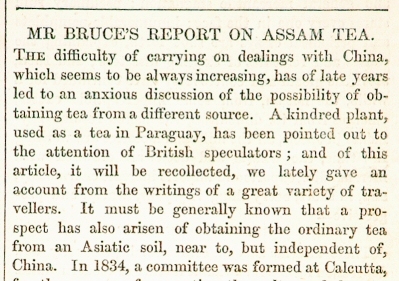 Report of the Assam tea which appeared on Edinburgh journal by Charles Bruce. THE difficulty of carrying on dealings with China, which seems to be always increasing, has of late years led to an anxious discussion of the possibility of obtaining tea from a different source. A kindred plant, used as a tea in Paraguay, has been pointed out to the attention of British speculators ; and of this article, it will be recollected, we lately gave an account from the writings of a great variety of travellers. It must be generally known that a prospect has also arisen of obtaining the ordinary tea from an Asiatic soil, near to, but independent of, China. In 1834, a committee was formed at Calcutta, for the purpose of promoting the culture of the teaplant in British India, and steps were immediately taken for introducing seeds and plants from China, Before these were procured, it became known that the tea-plant grew naturally in Assam, a large region five hundred miles to the north of Calcutta, situated on the great Bramah-pootra river, and, though not subject to the East India Company, yet under British influence. Mr C.A.Bruce (who, it appears, made this discovery fourteen years ago) was immediately appointed by the committee to survey the district, and report on its capabilities of producing the plant, under culture. 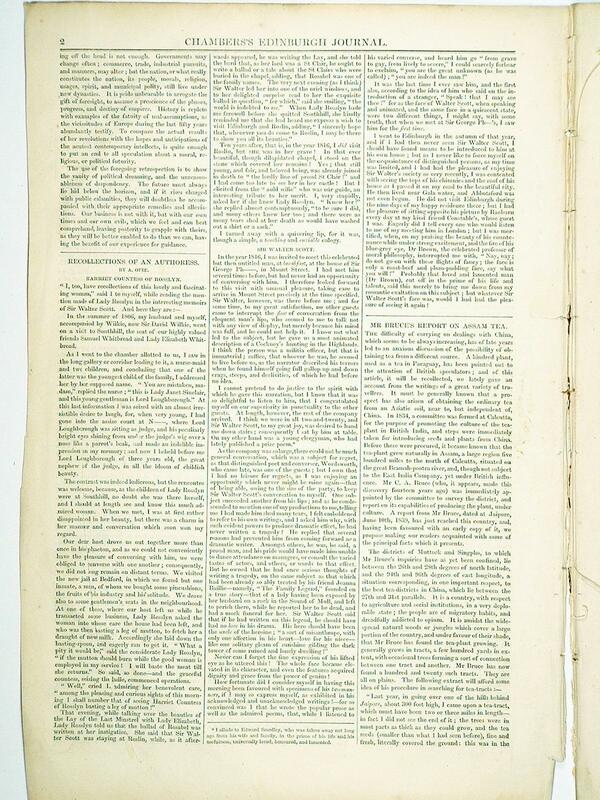 A report from Mr Bruce, dated at Jaipore, June 10th, 1839, has just reached this country, and, having been favoured with an early copy of it, we propose making our readers acquainted with some of the principal facts which it presents. The districts of Muttock and Singpho, to which Mr Brace’s inquiries have as yet been confined, lie between the 26th and 28th degrees of north latitude, and the 94th and 96th degrees of east longitude, a situation corresponding, in one important respect, to the best tea-districts in China, which lie between the 27th and 31st parallels. It is a country, with respect to agriculture and social institutions, in a very deplorable state ; the people are of migratory habits, and dreadfully addicted to opium. It is amidst the widespread natural woods or jungles which cover a large portion of the country, and under favour of their shade, that Mr Bruce has found the tea-plant growing. It generally grows in tracts, a few hundred yards in extent, with occasional trees forming a sort of connection between one tract and another. Mr Bruce has now found a hundred and twenty such tracts. They are all on plains. middle of November, and the trees had abundance of fruit and flower on them. One of the largest trees I found to be two cubits in circumference, and full forty cubits in height. At the foot of the hill I found another tract, and, had time permitted me to explore those parts, there is no doubt but I should have found many of the Naga Hills covered with tea. I have since been informed of two more tracts near this. In going along the foot of the hills to the westward, I was informed that there was tea at Teweack, or near it : this information came too late, for I had passed it, just a little to the east of the Dacca River, at a place called Chiridoo, a small hill projecting out more than the rest on the plain to the northward, with the ruins of a brick temple on it ; here I found tea, and no doubt, if there had been time to examine, I should have found many more tracts, I crossed the Dacca River at the old fort of Ghergong, and walked towards the hills, and almost immediately came upon tea. The place is called Hauthoweah. Here I remained a couple of days going about the country, and came upon no fewer than thirteen tracts. A Dewaniah who assisted me to hunt out these tracts, and who was well acquainted with the leaf, as he had been in the habit of drinking tea during his residehttp://liyn-an.com/wp-content/uploads/2018/07/edin-jrnl_18400125-1.jpgnce with the Singphoes, informed me that he had seen a large tract of tea-plants on the Naga mountains, a day’s journey west of Chiridoo. I have no reason to doubt the veracity of this man ; he offered to point out the place to me, or any of my men, if they would accompany him ; but as the country belonged to Raja Poorunda Sing, I could not examine it. I feel convinced the whole of the country is full of tea. Again, in going farther to the south-west, just before I came to Gabrew hill, I found the small hills adjoining it, to the eastward, covered with tea-plants. The flowers of the tea on these hills are of a pleasant delicate fragrance, unlike the smell of our other tea-plants ; but the loaves and fruit appear the same. This would be a delightful place for the manufacture of tea, as the country is well populated, has abundance of grain, and labour is cheap. There is a small stream called the Jhamgy river, at a distance of two hours’ walk ; it is navigable, I am informed, all the year round for small canoes, which would carry down the tea, and the place is only one and a half day’s journey from Jorehaut, the capital of Upper Assam. Southwest of Grabrew Purbut (about two days’ journey) there is a village at the foot of the hill, inhabited by a race called Norahs ; they are Shans, I believe, as they came from the eastward, where tea abounds. I had long conversations with them, and the oldest man of the village, who was also the head of it, informed me, that when his father was a young man, he had emigrated with many others, and settled at Tipum opposite Jaipore, on account of the constant disturbances at Munkum ; that they brought the tea-plant with them, and planted it on-the Tipum hill, where it exists to this day; and that when he was about sixteen years of age, he was obliged to leave Tipurm, on account of the wars and disturbances at that place, and take shelter at the village where he now resides. This man said he was now eighty years of age, and that his father died a very old man. How true this storyis, I cannot say, and do not see what good it would do the old man to fabricate it. This was the only man I met with in my journeys about the country who could give any account of the tea-plant, with the exception of an Ahum, who declared to me that it was Sooka, or the first Kacharry raja of Assam, who brought the tea-plant from Munkum; he said it was written in his Putty, or history. The Ahum-Putty I have never been able to get hold of; but this I know, that the information about the tea-plant pointed out by the old Norah man, as being on the Tipum hill, is true ; for I have cleared the tract where it grew thickest, about 300 yards by 300, running from the foot of the hill to the top. The old man told me his father cut the plant down every third year, that he might get the young leaves. To the west of Gabrew I did not find any tea ; but to the westward of the Dhunseeree river I found a species, though not the same as that we use. If the people on the west side of the Dhunseeree river were acquainted with the true leaf, I think tea would be found. I planted it all along the route I went, which may lead to its eventual discovery ; but people should be sent to search for the plant who are really acquainted with it. I think a vast quantity of tea would be brought to light if this were done.” Mr Bruce has also been engaged in experiments on the character of the tea produced in Assam. 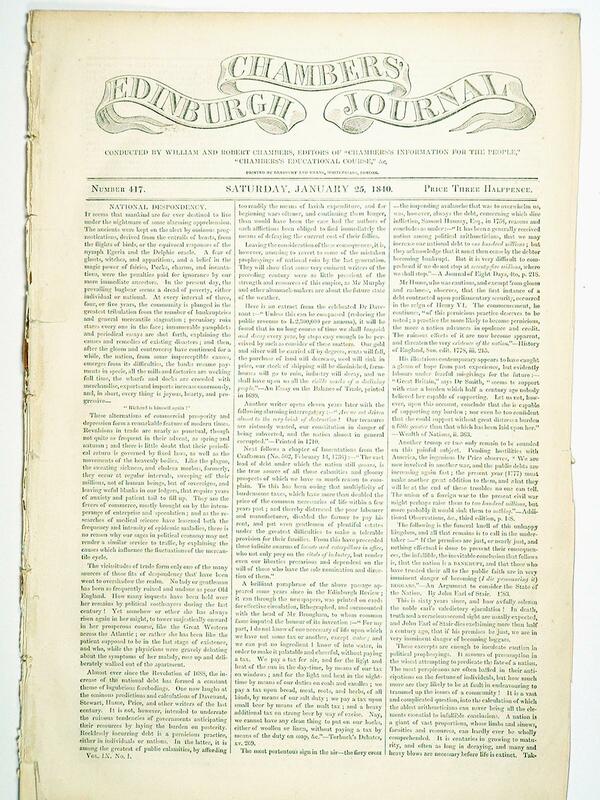 Ninety chests of the article prepared by him and his assistants were imported into London in 1838, and found, we are told, to be of good quality. In his report we find some notices respecting these operations : ” Until lately, we had only two Chinese black tea makers. These men have twelve native assistants ; each Chinaman, with six assistants, ean only superintend one locality, and the tea-leaves from the various other tracts, widely separated, must be brought to these two places for manufacture. The consequence is, that an additional number of labourers must always be employed to bring the leaves from so great a distance. The leaves suffer when brought in large quantities from a distance, as they soon begin to ferment, and the labour of only preparing them so far in process, that they may not spoil by the morning, is excessive. The men have often to work until very late to accomplish this. When labour falls so very heavy, and on so very few, it cannot be expected that it can be equally well executed, as if more had been employed. The leaves last gathered are also much larger than they ought to be, for want of being collected and manufactured earlier ; consequently the tea is inferior in quality. I mention this to show the inconvenience and expense of having so few tea-makers. The samples of black tea made by the twelve assistants having been approved of by the Tea Committee in Calcutta, it was my intention to have distributed the men among the different tracts ; hut the late disturbances on our frontier have prevented this arrangement, and I have been obliged to employ ten men in Assam (two others having gone to Calcutta in charge of tea) at the tract called Kahung, which is becoming a very extensive and important tea locality, so many others being near it, which can all be thrown into one. When we have a sufficient number of manufacturers, so that we can afford to have some at each tract or garden, as they have in China, then we may hope to compete with that nation in cheapness of produce, nay, we might and ought to undersell them ; for if each tract or garden had its own tea-maker and labourers, the collecting of the leaves would not perhaps occupy more than twelve days in each crop; after which the men might be discharged, or profitably employed on the tea-grounds. But now, for the want of a sufficient number of labourers and tea-makers, there is a constant gathering of leaves throughout the month ; and, as I said before, those gathered last can only make inferior teas ; besides the great loss by the leaves getting too old, and thereby unfit for being made into any tea, and all this entirely for want of hands to pluck the leaves. It is true we have gained twelve black tea makers this year, in addition to the last; and twelve more native assistants have been appointed, who may he available next year to manufacture tea independently, as they were learning the art all last year. We have also had an addition to our establishment of two Chinese green tea manufacturers, and twelve native assistants have been placed under thern, to learn ; but what are those compared to the vast quantity of tea, or the ground the tea-plants cover, or might be made to cover, in three years, but a drop of water in the ocean? We must go on at a much faster pace in the two great essentials-tea manufacturers and labourers-in order to have them available at each garden, when the leaves come into season.” Mr Bruce has been engaged in extensive operations in introducing tea-plants from China, and transplanting those which are indigenous. Many, from various causes, have failed; but he mentions his belief, that the tea-plant is so hardy that it will live in almost any soil, provided it be planted in deep shade, and with plenty of water near the root. The reason for these transplantations seems to be that the tea-tree is only of use within a certain age. Many of the indigenous trees of Assam are beyond this age and otherwise unsuitable. On the other hand, planting seed is not calculated to be immediately satisfactory, as until the third year they produce nothing, and are only in maturity when about six years old. Mr Bruce argues for the propriety of burning or cutting down the old trees, in order to have fresh shoots from the stock, which he thinks would add greatly to their productiveness, and cause them to afford a fine and delicate leaf. He confirms the fact lately made known, that the black and green tea are gathered from the same plant, and that the difference is entirely owing to the different states of the leaves and the different modes of preparation. His account of the manufacture of green tea by his Chinamen is extremely curious, but too long to be here admitted. The demoralisation produced by opium, and a liking for independent labour which characterises the Assamese, throw difficulties in the way of a large production of tea in Assam. Mr Bruce looks to the introduction of workmen from other parts of India, for the means of carrying on the manufacture on a large scale. He also thinks it not impossible that the leaves may be sent home in a certain state to this country, and here subjected, by the cheap means of machinery, to those nice and tedious processes which they have to undergo from manual labour in China. “After a year’s instruction under Chinamen,” says he, ” it might he left to the ingenuity of Englishmen to roll, sift, and clean the tea by machinery, and, in fact, reduce the price of the green tea nearly one-half, and thus enable the poor to drink good unadulterated green tea by throwing the indigo and sulphate of lime overboard. “Five tea tracts were under culture in Assam in 1838, the produce of which amounted to 5274 pounds. Seven new tracts will be under culture in 1840, when Mr Bruce thinks the total produce will be 11,160 pounds. These operations are at the cost of the company ; but it is designed ere long to throw the business open to private speculation, Mr Bruce enters into some calculations to show the probable profits of private adventures in this line. He takes ten tracts, each 400 by 200 yards, and reckons the whole expenses of cultivation the first year at 16,591 rupees (which we believe is the same as ￡1659), of which 4304 will not need to be repeated the second year; and the value of the produce he estimates at 35,554 rupees, thus giving a profit of upwards of cent, per cent. Upon the whole, there seems little reason to doubt that Assam is physicaily capable of producing that important article, on which eight or nine millions of money are annually spent in the United Kingdom. It may, however, be long before such a system for its manufacture be established in the country as to ensure the culture of the plant on a large scale, the selection of the proper leaves, and the many niceties required in.